Unisex goalkeeper full-length pants for adult (for men and women). Padded on the sides and above the knee with a special padded weave. Contrasting piping. 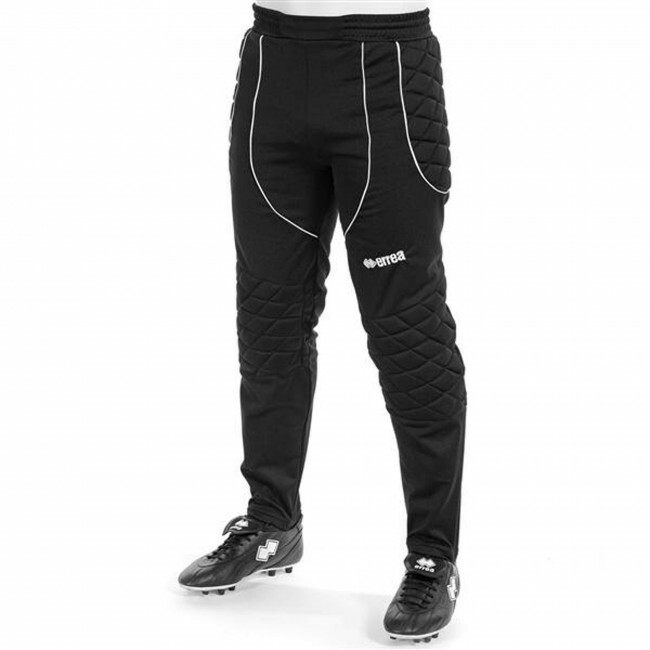 Highly technical pants, specially designed for goalkeepers. Suitable for any sport, for training and competitions. They will protect you during dives or slides. Elasticated waist with draw string. Stirrups for best pant fitting. The Guardian goalkeeper pants by Erreà combine the quality and comfort of the Pitch model, with a dynamic and trendy design. These pants, as well as being extremely comfortable and having resistant and thick paddings made of a decorated texture, feature special white contrasting pipings that give these pants a colourful touch. Here too we included stirrups to slip your feet in, for perfect wearability. We also included an elasticated waistband with draw string to adjust the pants as required. They are suitable to wear to the most intensive training sessions, however they are also the ideal garment for your toughest games.